A clear and definitive work on the atonement for every believer. At the core of Prince's message is this nugget of truth: Through the atonement, all the evil due to us came on Christ, in order that all the good due to Christ might be available to us. About "Atonement: Your Appointment With God"
Prince unpacks what God has provided for us through the cross, including nine "exchanges"-good in exchange for evil-and five aspects of deliverance. Prince unpacks what God has provided through the cross, including nine "exchanges"-blessings in exchange for evils-and five aspects of deliverance. Prince unpacks what God has provided for us through the cross, including nine "exchanges" blessings in exchange for evils and five aspects of deliverance. 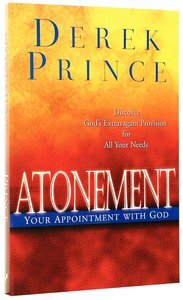 In "Atonement, Your Appointment with God", Prince tackles a vital matter of faith presenting this message: Through the atonement, all the evil due to us came on Christ, in order that all the good due to Christ might be available to us. Prince explains exactly why Jesus has provided for us through his atoning work on the cross. Prince unpacks the nine "exchanges" of the atonement, as well as the five aspects of deliverance, then maps out how believers can appropriate these into their lives.